To entice colorists, the wildly popular author of Animal Kingdom and Tropical World has created an enchanting collection of images of our fine feathered friends and other extraordinary animals who dwell in the treetops. 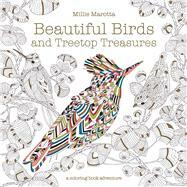 Millie Marotta’s engaging, intricately designed illustrations feature beautiful hummingbirds, Major Mitchell's cockatoos, lyrebirds, cardinals, marvelous spatuletails, pygmy owls, and laughing kookaburras. Fans will rush to grab their crayons, colored pencils, pens, and brushes. Millie Marotta is a freelance illustrator working in her studio by the sea in a little corner of West Wales. She has developed a mild obsession with all things flora and fauna, which along with intricate pattern and detail, remains an ongoing theme in her art. She works in both traditional and digital media for editorial, advertising, merchandising, web, and textiles. Her clients range from Virgin Atlantic to Penguin Books.